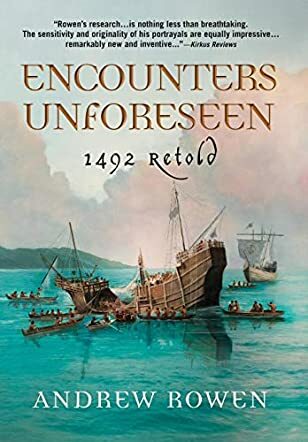 Encounters Unforeseen: 1492 Retold by Andrew Rowen is a phenomenal historical novel that transports the reader back to the 15th century and brings them into contact with some of the historical personalities that have shaped history. The story is centered on the epic journeys of Columbus and his first encounters with the Native Americans. In this spellbinding book, the author recreates the world as Columbus must have known it, allowing the cultural shock to come out powerfully, exploring the reactions of local chiefs upon their encounter with Columbus and his European companions. Readers will encounter great characters, people with their own cultures and world views, characters like Queen Isabella and King Ferdinand, and a host of others. In this book, readers will follow the adventures of Columbus, his exploits, and his abject solitude as well. Few authors recreate historical worlds and craft characters who feel so real, even flawed, and who are imbued with a strange humanity, and Andrew Rowen has done just that. Readers will enjoy the tension and the conflicts developed at different levels of the story. I particularly enjoyed the way the soul of the Native Americans comes across the narrative. The characters are intriguing, each reflecting a rich culture and a historical background that will excite the reader. There is no doubt that Encounters Unforeseen: 1492 Retold is well-researched, intelligently plotted, and narrated with the voice of a master. Through fiction, the author allows readers to look at history from the perspective of those often considered conquerors. This is an awesome read for fans of historical fiction with strong personages. I couldn’t stop reading from the moment I opened the first page.